Capt. 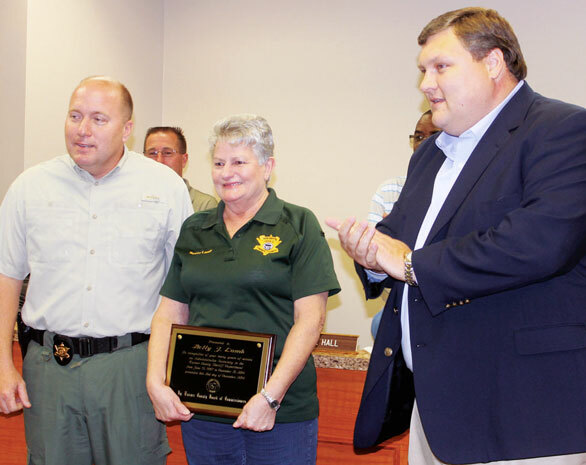 Betty Lamb, center, was honored by the County Commissioners last week on her retirement from the Sheriffʼs Department. Mrs. Lamb served under several sheriffs. Sheriff Andy Hester and Commission Chairman Sam McCard described her as a tremendous asset to the department and someone who will be very much missed. A retirement party for Captain Lamb will be held Dec. 11 at the Turner County Civic Center from 2-5 p.m. Betty is retiring after 28 years of faithful service from the Turner County Sheriff's Office. Please join us in celebrating her accomplishment and to wish her the best in her future endeavors. Also Honored. County Commissioner Greg Hudgins receives his appreciation plaque from Commission Chairman Sam Brown.